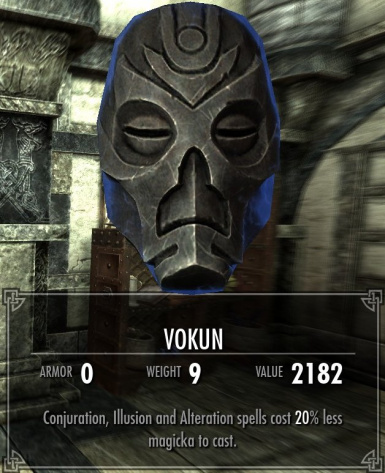 Don't you hate it how Dragon Priest Masks with mage-centric stats (Vokun, Morokei, Nahkriin) are either Light Armor or Heavy Armor, breaking your Mage Armor perk? Look no further for a fix. Whew! After ~2 years I've gotten back into Skyrim, so I figured I should update this. Several people complained about this mod appearing outdated and throwing errors with TES5Edit et cetera, as it was made before the Creation Kit's release, so I simply recreated it. 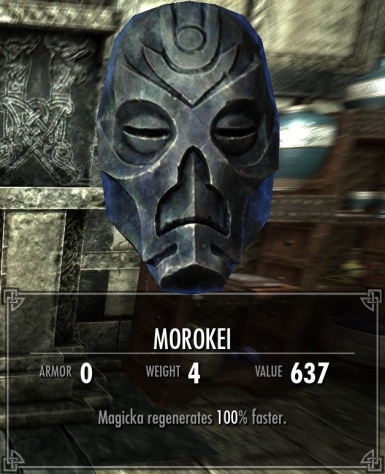 Weight is reduced, circlets can now be equipped alongside the masks, and there should also no longer be issues with the Morokei enchantment, as that was fixed by official Skyrim patches. As it is, this mod should not require any more updates, but if you find some sort of issue, let me know! Might make versions of the Dragonborn masks, if necessary. Let's see how the feedback is. - Classifies them as clothing rather than heavy/light armor. - Removes any armor rating. - Reduces Weight from 5-9 to 2. This allows pure mage characters to take advantage of the Alteration tree's 'Mage Armor' perk while keeping items that were obviously intended for them, without unbalancing the game. No other attributes are changed, meaning a very clean and balanced fix for the woes of magic-savvy Dragonborn worldwide. Optional files include: a graphics-free version (hiding the masks) as well as the same treatment applied to the Diadem of the Savant. 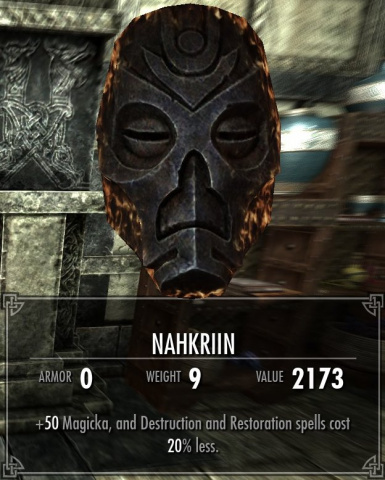 Tip: This mod should work with all Dragon Priest Mask re-models and re-textures, assuming they keep the original item intact and do not change anything beyond the graphics. To avoid clipping problems with the Archmage's Robes, you may opt to get a mod like Hoodless Archmage Robes. Enjoy this quality handiwork by yours truly! - Completely remade using the Creation Kit. Should work more nicely with other mods now, and includes the enchantment fix. - Attempted bugfix to make the Dragon Priest Mask play nice with hooded robes like the Arch-Mage's Robes. Report any errors you see! If this is b0rked, just download the clean 1.0 version.